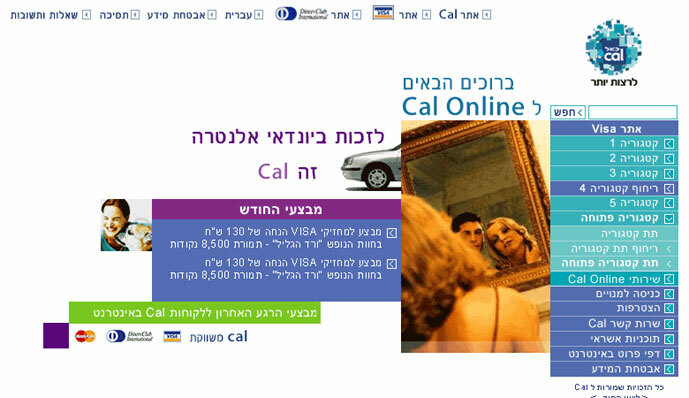 In 2001, CAL- one of the biggest Israeli credit cards companies (issuer of VISA, Diners and MasterCard) – was about to change its brand entirely.A new law allowing all credit card companies to issue all credit cards, has turned this market segment upside down, and caused many changes that these companies had to face.The brand change was part of a strategic plan that meant to keep the loyalty of CAL’s existing customers, while acquiring new potential clients. Main CAL’s website This corporate site provided the user support in this brand change. The user could read about the change, benefits and instructions for farther action. It also contained messages which increased the user’s reassurance on the brand and tried to convey the promise embodied in the new brand. The visual guidelines we set conveyed the “No limits” and “Enriching the individual” concepts. A unique approach to the corporate portal was created to reflect the uniqueness of the company.The screen was treated as a limitless space, without definite borders, where navigational and content elements are juxtaposed on its surface, creating various compositions, which implied on the extensive opportunities the customer has when using CAL’s credit cards. To emphasize the brand’s message we based the design on modular shapes (mainly rectangles) that would enable us to keep a flexible yet recognizable structure, without using a constant grid. The dynamic compositions were assembled from asymmetric elements and colored with energetic palette. The forms were floating on the white space, detached from the browser borders.The rectangles were chosen for their multi-purpose shape, and because they comprise CAL’s new logo.The message was that no rules apply when using CAL. Each person can shape their own world according to their needs and desires. Enhance trust: use “real world” insignia to support online credibility. All the home pages contained Cal’s brands stamp to assure the user that there’s real, respected company behind this site. As a textual form, revolving upwards for the rest. Promotional banners, both in flash and other technologies, were added through out the site. Putting method to the madness, we devised the goal-oriented navigation system, which remained consistent all over the site. This system included the top bar , side bar and icons (which used the square element from the logo). The side bar is the actions bar. It contained each brand’s marketing and promotional information as well as Cal’s “Online services” section.The side bar slides down and opens to present the relevant links, every time the user chooses a category.Cal’s “Online services” is the marketing tool for promoting the different online programs (such as credit payment, credit reports), and is frequently used to view new and upcoming campaigns.From “Cal on line” the user can also enter directly to online services. The inner content pages maintained the same look & feel and the rectangles/ No boundaries motive continued. A separate web site was created for each card type, assuring that each customer can find his or hers private place within the site. Each brand had its unique attributes within the general brand. That was clearly shown at the proportions between the Cal and its sub brands logos as well as using components that were identical all over the site. Each brand had its own teasers and information section. Visa’s was the most important of the sub brands’ sites.It had additional sales and marketing tools as well as various content areas,which were aiming to support the brand shift.Visa’s imagery leading motives were “dynamism” and “border crossing”, conveying the notion that Visa is everywhere, and is constantly on the move, to adjust to the user’s changing needs. Dinners had to provide reassurance to its users with excessive trust areas as well as promotional teasers.As a “high class” credit card, Diners strategy was to display the good life and promise a better, relaxed and luxurious future for its holders. One was to encourage card owners to join the extra net and to enjoy online services. The other was to provide educational information on the different services. 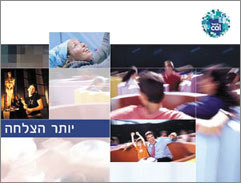 The page was divided to introduction (1), which listed available benefits, gentle emotional promotional clip area (3) and highlighted “join us” zone followed by program details (2). This software’s goal was to encourage Credit card holders to expand their e commerce activities (which will increase Cal’s revenue). The software provided unique number to each e commerce transaction and by that solved the problem of providing real credit card number in e commerce transactions and protected the card holders.Our design was highly functional and customer-oriented. The concept was to resemble credit card in its look, and thus imply on the application’s functionality.The application’s appearance took after the look & feel of CAL’s credit card.The use was easy and intuitive, the application freed the users from the fear of being cheated.Trade rates increased, and CAL was able to give service that assess its credibility. This tool enables the users to control their financial status via the Internet.As another aspect of Freedom is control over one’s actions, the users were able to view their Credit card status online, audit their bills, and perform changes in their future debits. Another important aspect of freedom (with regarding to money) is the ability to spend it at will. The next service we designed was a money transfer application called CAL Direct . This program enabled the user to transfer cash from one credit card to another credit card! We supplied CAL with numerous promotional tools in order to market itself better to the online users’ community. Creating a sense of community and nourishing the feeling that CAL cares about their customers, led us to the creation of this monthly newsletter. Our goal was to promote new programs and ideas to Cal’s customers, while assessing CAL’s brand. We designed a clean and light look and feel, consistent with the site’s look & feel, and delivered the feeling of excitement. Promoting the use of Cal’s tools was not limited to the web. Targeted presentations were created and published to specific market segments, offering customized services. An example of that was the “Business card” presentation, sent to CFO’s around the country, displaying the benefits of its use in a sharp and straightforward attitude. These screen savers were created as part of the process of implementing the new brand within the company’s employees.It’s content reflected the brand’s main messages.